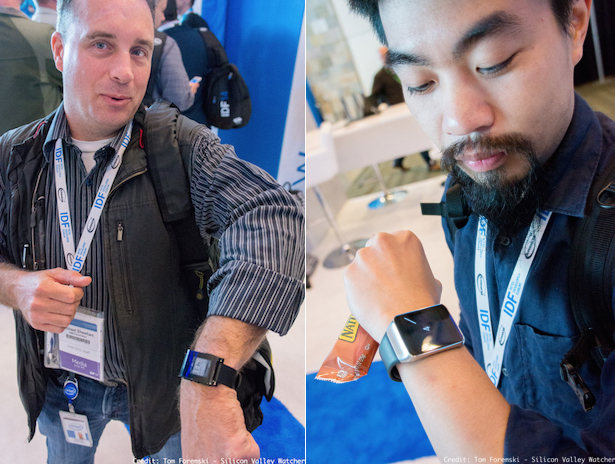 Intel Free Press writers Michael Sheehan and Marcus Yam show their smart watches at IDF 2014. Thinking of gliding through airport security wearing your new FitBit, Android Wear watch or soon, your Apple Watch? Think again. New wearable technology in the form of smart watches, activity trackers and jewelry with embedded tech may cause confusion for security screeners. The Federal Aviation Administration (FAA) and the Transportation Security Administration (TSA) have yet to write official policies around security, safety and usage of wearable technology. The TSA says that over 1.75 million people pass through its security checkpoints every day. "There are millions of things that people can bring through a checkpoint so it's hard to give a policy or directive on one piece whether it's a phone or other type of jewelry, so it's in the best interests of the passenger to get items screened or put through an X-ray machine just to verify that they do not alarm," said Ross Feinstein, spokesperson for the TSA. "Our goal here is to ensure that there are no prohibited items on the passenger or in their luggage when they get access to the airport." Under current rules, the FAA classifies wearable technology as a Personal Electronic Device (PED), defined as any piece of lightweight, electrically powered equipment capable of communications, data processing and/or utility. Examples are: lightweight electronic devices such as tablets, smartphones and electronic toys. The FAA doesn't distinguish between a PED and wearable tech products such as a smart watch or a light-up skirt. "If the device performs PED functions, then PED rules apply," said an FAA spokesperson. It is not clear how much attention companies working on wearable technology are paying to security situations such as at airports, but the issue is bound to become more prevalent as more devices come onto the market. Because there's no specific policy in place, experiences - and opinions of protocol - during travel may vary. Tim Pettitt, product line manager in Intel's New Devices Group who helped design the MICA wearable (below), says that while Intel and Opening Ceremony follow the Federal Communication Commission's (FCC) guidelines on capabilities needed, they haven't worked directly with the TSA or FAA. Pettitt says whether or not your wearable has a cellular modem may determine what actions you need to take when going through security or using it on an airplane. "In most cases, you can leave your wrist-worn wearable on through security and won't need to power it off in flight," says Pettitt. "Most airlines are not concerned about Bluetooth and will explicitly tell you to shut down your Bluetooth device if required. However, if you have a device, like MICA, which has a cellular radio, you need to put it into airplane mode just like you would a phone." A recent travel experience while wearing a Samsung Galaxy Gear Live Android Wear was in line with Pettitt's statement. For security checkpoints that allowed jewelry and other accessories to remain on the person, the smart watch was treated no differently - though it's unclear if security personnel recognized that it was an electronic device. 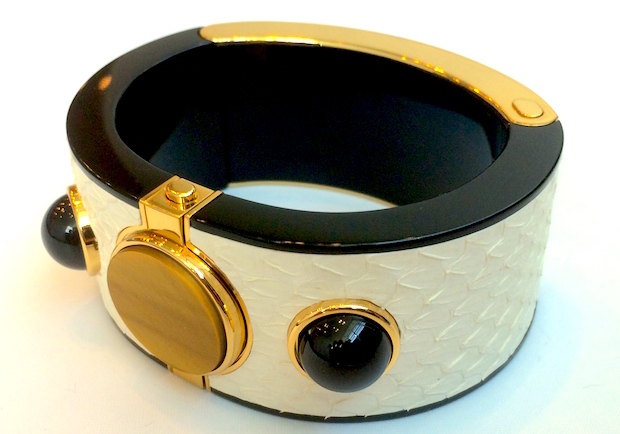 Fashion wearables such as the MICA may further blur the lines of what's considered jewelry and a PED. While removing a bracelet or necklace may just be a minor inconvenience, tech-laced clothing with integrated sensors could pose logistical problems for passengers asked to place all electronic items in the plastic bins. Onboard aircraft, passengers are now always instructed to switch all personal electronic devices into airplane mode, and most wearable devices today have such on/off capabilities for radios. "For travel purposes, we did make it possible to turn off the wireless capabilities directly from the touch-screen interface of the new [Basis] Peak," said Jef Holove, former CEO of Basis and now general manager in Intel's New Devices Group. Basis, a maker of biometric smart watches, was recently acquired by Intel. While there's yet to be a formal policy in place, agency representatives and wearable makers recommend following a number of guidelines when traveling with wearables. - Consolidate - Feinstein recommends consolidating all of your electronic gadgets into your carry-on, handbag, purse or briefcase and passing your carry-on through the X-ray screening device. - Leave it at home - If you don't absolutely need your expensive wearable, it's best to leave it at home. - Fully charge your wearable - Condé Nast Traveler reported the TSA wants travelers to validate that your cell phone is real by powering it on. When asked about this new policy, Feinstein said it was for certain airports outside the United States for flights coming to the United States and that it was not a policy implemented in domestic airports. It's often difficult to find free plugs and enough time at airports to charge your device, and most airplanes don't have plugs. - Follow the PED rules As per FAA guidelines, if the flight attendant asks you to turn off your wearable or put it in "airplane mode," do it otherwise you may have it taken from you. Remember, not every security screener has seen each and every wearable on the market. Some ankle-worn activity trackers have even been confused by authorities as a law enforcement ankle bracelet.